Korea celebrated the return of nearly 300 copies of its ancient royal documents that were looted by French troops 145 years ago with welcome ceremonies and performances in Seoul and Ganghwa Island on Saturday. The ceremonies came after the final batch of 297 volumes of Uigwe arrived in Seoul from Paris late last month. The books have been shipped back to Seoul in four separate installments since April 14. Dressed in vibrant court costumes from the Joseon Dynasty, some 500 participants carried copies of the returned books in a traditional Korean palanquin along the Sejong Street to Gyeongbok Palace in Seoul. The palace served as the main royal residence during the Joseon Dynasty. 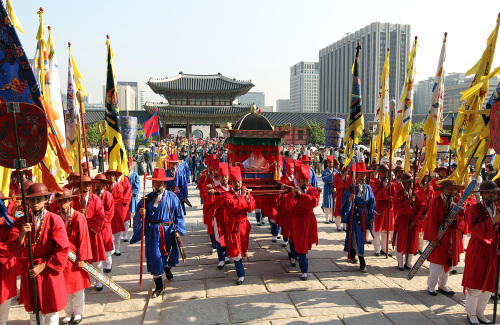 Once the palanquin entered the palace through its main gate Gwanghwamun, the books were welcomed by traditional Korean court music and dance performances. President Lee Myung-bak, who attended the event in hanbok, Korea’s traditional costume, said the government will continue trying to retrieve other Korean cultural relics currently housed in foreign countries around the globe. Jack Lang, former culture minister of France, Vincent Verger of Paris Diderot University, and Park Byeong-sen, who discovered the royal texts at the National Library of France in 1975, flew to Seoul from Paris to attend the official celebration. Although the royal documents ― which contain both text and hand-drawn illustrations of significant court rites and ceremonies of the Joseon Dynasty (1392-1910) ― are returning on a five-year renewable loan basis, their return is in effect permanent, former French culture minister said. Lang also offered assurances that the French government won’t reclaim the books. Historian Park Byeong-sen, who discovered the royal documents at the National Library of France in 1975 while working there as a librarian, said while she is overwhelmingly happy about the return of the books, Korea must continue making efforts to remove the word “loan” on the returned documents. 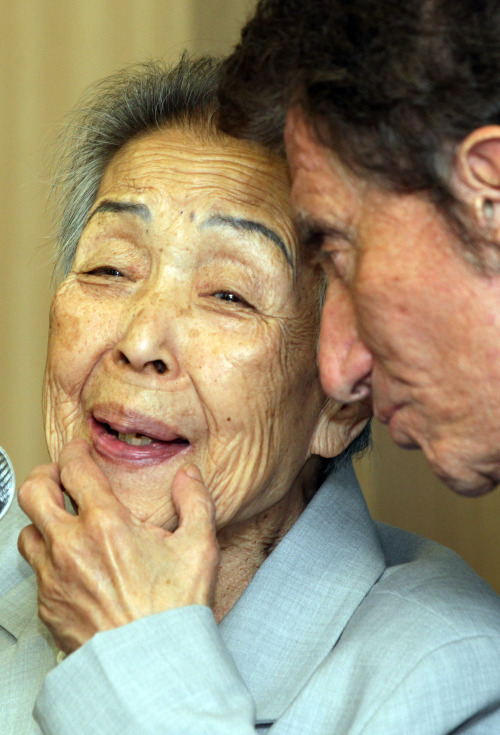 The 82-year-old, who now has French citizenship, will stay in Korea for three months later this year to conduct research on the French invasion in 1866, during which the looting of the royal books housed at Oegyujanggak took place. She was diagnosed with colorectal cancer in 2009. French troops in 1866 seized the royal books, along with a vast amount of silverware and other royal artifacts, during their invasion of Korea’s western island of Ganghwa in retaliation for the execution of French Catholic priests by Joseon authorities. Before the invasion, the looted books and items had been stored at an ancient royal library called Oegyujanggak ― an annex of the royal Gyujanggak library in Seoul ― on Ganghwa. Seoul began demanding the return of Uigwe after Park discovered them at the National Library of France in 1975. Following Park’s report of the existence of Uigwe, the Korean Embassy in France officially requested the return of the volumes to Korea in 1992. In 1993, then-French President Francois Mitterrand visited Seoul prior to France’s sale of its high-speed train TGV technology to South Korea. In a summit with then-Korean President Kim Young-sam, Mitterrand returned one of the stolen royal books and promised to return the rest of the Uigwe collection. After a series of long disputes and negotiations, France last year finally agreed to return the documents to Seoul on a renewable loan basis at APEC and the G20 Seoul Summit. Celebrations also took place on Ganghwa Island on Saturday, at the site where the ancient library was located in the 19th century Joseon. The returned books will be housed at the National Museum of Korea. The royal books will be featured at the museum’s special exhibition, “The Return of the Oegyujanggak Uigwe from France: Records of the State Rites of the Joseon Dynasty,” from July 19 to Sept. 18.